The is a 36° Lens Tube with Lens for the ETC Source 4 Black Ellipsoidal Spotlight. It provides a wide spread of light when installed in any ETC spotlight. 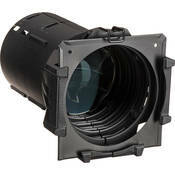 ETC Source Four spotlights are sold with lens tubes of 5, 10, 19, 26, 36 or 50° spread. Install this tube if your present 19-50° ETC spotlight provides a beam that's too narrow for your application. Expands the capabilities of your Source Four spotlight. Box Dimensions (LxWxH) 11.4 x 10.6 x 10.4"